General Person earning INR. 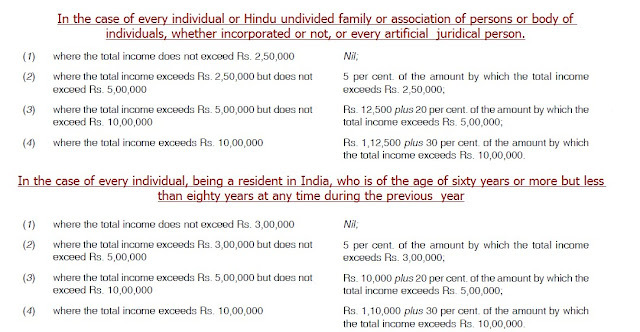 2.5 lakh annually has been exempted from paying taxes, while those having income upto INR. 5 lakh will be charged income tax at 5 % (earlier 10%). surcharge of 10% will be levied on people with annual income between INR. 50 lakh to INR. 1 crore. surcharge of 15% will be levied on people with annual income above Rs 1 crore. Rebate - maximum of Rs.2,500 from the tax payable would be admissible under section 87A of the Act to those individuals whose total income does not exceed Rs. 3,50,000 p.a. Section 10(12A) provides that payment from National Pension System (NPS) trust to an employeeon closure of his account or opting out shall be exempt upto 40% of total amount payable to him. 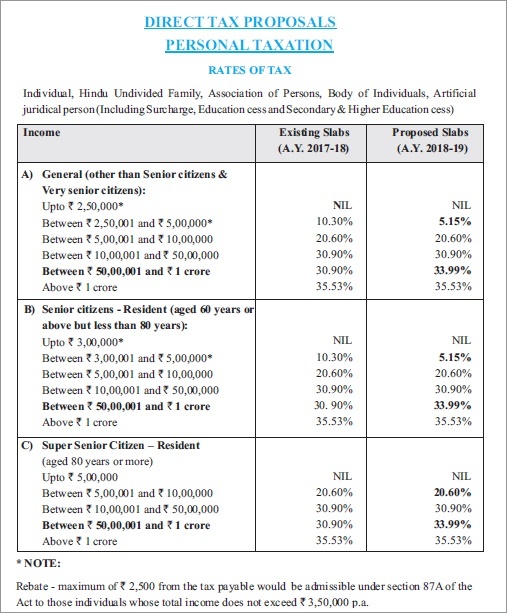 Sub-section (2) of section 20 provided in Chapter VI of the Pension Fund Regulatory Development Authority Act, 2013, permits withdrawals, not exceeding twenty-five per cent of the contribution made by the subscriber, from the individual pension account subject to certain conditions specified by the regulations, such as purpose, frequency and limits. Such partial withdrawals are presently not exempted from tax under the Act. 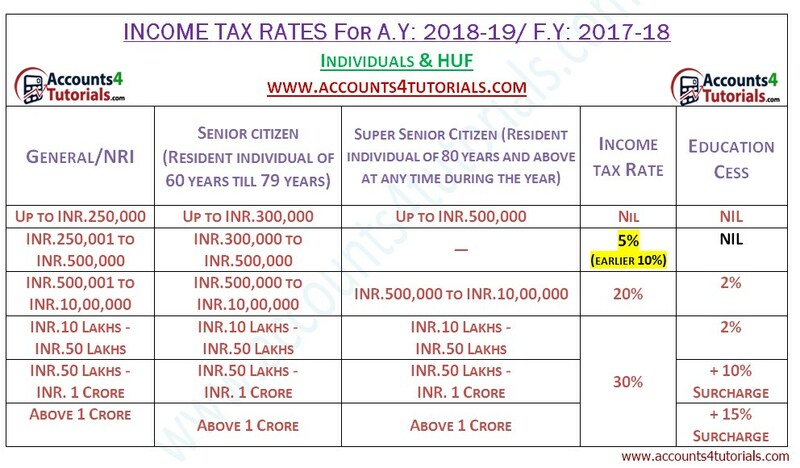 Under the existing provisions of section 80CCD (1) of the Act, an individual, not under any employment, is allowed deduction in respect of amount deposited in a previous year in his account under a notified pension scheme provided the same does not exceed 10% of his gross total income. It has now been proposed to enhance the above limit from 10% to 20% of the gross total income. It is, however, to be noted that the amount of deduction allowable under sub section (1) of this section shall not exceed Rs.1.50 lacs. Under the existing provisions of section 80CCG, deduction upto ` 25,000 is admissible to an individual investor who invests in specified listed equity shares or units of equity oriented fund, subject to conditions specified therein. The said deduction is available for 3 consecutive assessment years starting from the year of initial investment. It is now being proposed that deduction under section 80CCG shall be phased out and shall not be available in respect of amount to be first invested during assessment year 2018-19 and onwards. Grand fathering provisions are, however, provided in respect of initial investment made during the assessment year 2017-18 or prior thereto. 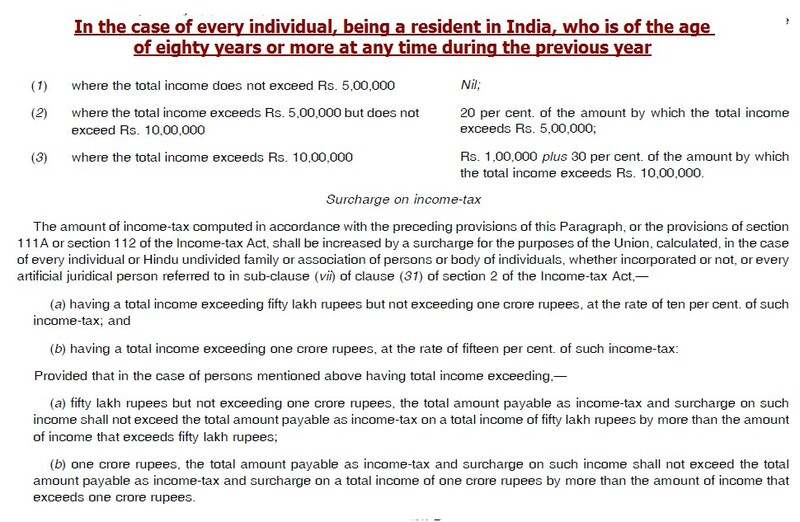 (3) where the total income exceeds Rs. 10,00,000 : Rs. 1,00,000 plus 30 per cent. of the amount by which the total income exceeds Rs. 10,00,000. 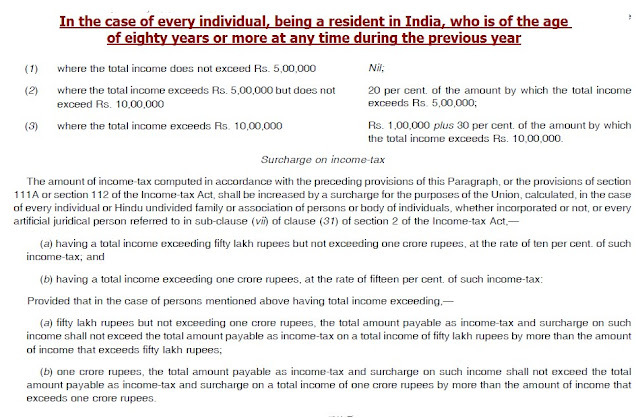 (b) one crore rupees, the total amount payable as income-tax and surcharge on such income shall not exceed the total amount payable as income-tax and surcharge on a total income of one crore rupees by more than the amount of income that exceeds one crore rupees. (3) where the total income exceeds Rs. 20,000 : Rs. 3,000 plus 30 per cent. of the amount by which the total income exceeds Rs. 20,000. Provided that in the case of every co-operative society mentioned above having total income exceeding one crore rupees, the total amount payable as income-tax and surcharge on such income shall not exceed the total amount payable as income-tax on a total income of one crore rupees by more than the amount of income that exceeds one crore rupees. Provided that in the case of every firm mentioned above having total income exceeding one crore rupees, the total amount payable as income-tax and surcharge on such income shall not exceed the total amount payable as income-tax on a total income of one crore rupees by more than the amount of income that exceeds one crore rupees. (ii) other than that referred to in item (i) : 30 per cent. of the total income. Provided further that in the case of every company having a total income exceeding ten crore rupees, the total amount payable as income-tax and surcharge on such income shall not exceed the total amount payable as income-tax and surcharge on a total income of ten crore rupees by more than the amount of income that exceeds ten crore rupees.